Did you leave your motorcycle title in the dust? A vehicle title should always be kept in a safe place, but sometimes even the most important documents go MIA. If you can't find yours, you'll need to get a replacement motorcycle title. Read on to learn how to handle a lost motorcycle title. All states allow vehicle owners to replace a lost title fairly easily, provided that you have the right paperwork and processing fees. Requirements for replacing a title vary from state to state, but most likely you'll need to complete an application for a replacement certificate of title. If your motorcycle title lists two owners, all persons listed on the original title might need to sign the application. If you have an open lien on your motorcycle, the lienholder might need to apply for the duplicate title, or submit a notarized lien release for the motorcycle. 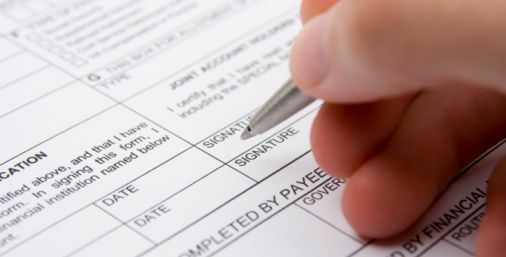 Most states require a notary to witness your signature on the application. In that case, anyone who signs the application will need to sign with a notary present. Some states require a statement regarding what happened to the lost title. Ensure your description is honest and as accurate as possible. You will most likely submit your application to your county treasurer's office or department of motor vehicles. Check our DMV Office Finder for the nearest branch office. You will need to pay a fee to process your request. Fees and acceptable payment methods vary by state. If you're trying to sell or give away your motorcycle any time soon, you'll have to wait. It may take a few days to receive your new title, and you know you can't transfer ownership without that piece of paper. Many state departments of transportation require a mandatory waiting period before they will issue a replacement title. This time allow the state an opportunity to ensure that the information on the application is accurate and the motorcycle isn't a stolen vehicle. Once your duplicate title arrives, stow it away in a safe place! Do not put your new motorcycle title in your saddlebag. You might be a road warrior, but your replacement title should live a more sedentary life. Find a secure place off the road for this important document. Bikers: Have you ever lost a motorcycle title? Tell us what happened in the comments section below.